Review, pics and info for RARA Indoor Playscape in Downtown Rochester MI. 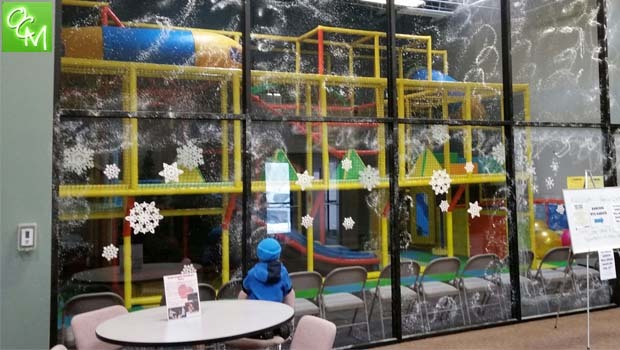 RARA (Rochester Avon Recreation Authority) Indoor Playscape structure is open for residents and non-residents of Rochester and Rochester Hills. The RARA Indoor Playscape is an affordable option for additional fun while visiting the RARA complex which features sports leagues for kids and adults year-round. If one child is attending a RARA Dance Class or indoor sporting practice, another child can occupy themselves with this indoor playground! The RARA Indoor Playscape is open whenever RARA is open. The RARA Indoor Playscape measures 18×32 feet so it’s a nice, cozy size that allows parents to easily keep an eye on their kids while playing. You won’t “lose” your child in this playscape so feel free to sit back and relax while the kids have fun and get active. One particularly nice feature is the convenient sinks and sanitizer station near the equally convenient restroom. The facility itself is also immaculate. The RARA Indoor Playscape is convenient for many different scenarios. It’s a great option for parents to occupy time with young children while their older children are attending classes. It can be rented out for birthday parties. It’s also a great option for getting a playgroup together to play on a snowy or rainy day. Additionally, the RARA Indoor Playscape offers Child Watch care. Child Watch is for parents who are attending or spectating programs for RARA or other partner organizations. For example, if a parent is taking a class or participating in a sport at the RARA facility, they can bring their child/children to the RARA playscape and have them supervised for a small fee while they are in their class. There are many options for adults to participate in at RARA – RARA Rochester Avon Recreation Authority has adult sports leagues in mens basketball, mens over 40 soccer, 4v4 soccer, softball, and coed soccer. Numerous fitness programs are offered from Basic Yoga all the way to Boot Camp. To take advantage of the Child Watch program, parents need to provide a 24-hour notice to set up a Child Watch. The maximum Child Watch time is 2 hours. The RARA Indoor Playscape is for kids 12 and under, and under 5′ 2″ in height. For cost info on RARA Indoor Playscape Rochester, visit rararecreation.org or call RARA at 248-656-8308.